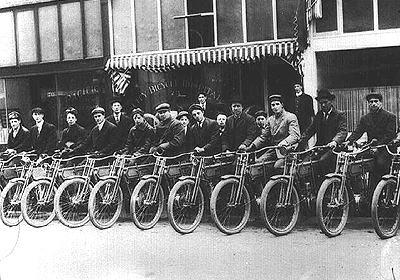 1910 A line of motorcyclists show off their bikes in front of the City Bicycle Hospital in Portland. The craze for the "wheel" has been replaced with the passion for a "motor." The bicycle would make its comeback in 1981 when Specialized introduced the first mass-produced mountain bike, the $750 Stump Jumper. The National Sporting Goods Association Sports Participation in 2000 report shows an increase in bicycle riding to 42.5 million Americans. In 1998, cycling generated $5.8 billion in bicycle product sales. The only other recreational sports that came close to reaching those numbers were golf at $4.8 billion and running at $2.1 billion. 1914 Sears Roebuck and Co. shipped bicycles across the country creating and revolutionizing the mail-order industry and installment buying. The top-of-the-line World Supreme New Master Bicycle, Coaster Model sold for $26.95.The 1914 catalog promoted the Kenwood Bicycle, "A Big Value in a Low Priced Bicycle," for $11.95. 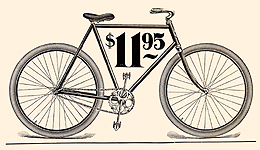 "This bicycle would cost you elsewhere from $15.00 to $18.00. A striking example of our low prices, made possible by our factory to customer direct plan, with only one profit added to the manufacturing cost. This bicycle contains good material and is the best value ever offered in a low priced bicycle." Kenwood continues as a Sears brand for home appliances and consumer electronics. The same catalog introduced the 1914 Model 9-Horse Power De Luxe Sears Auto-Cycle motorcycle. Sears sold as many as 100,000 bicycles a year during the late 1890s through its catalog. 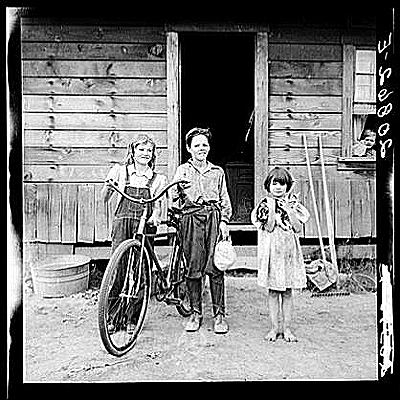 1939 Three of the four Arnold children. The oldest boy earned the money to buy his bicycle. Michigan Hill, Thurston County, Western Washington. Dorothea Lange was a legendary photojournalist whose images chronicled the Depression and World War II for the U.S. government and LIFE magazine. Her photograph of a Migrant Mother is one of the defining American images of the 20th century. 1914 - Bike of the U.S.A.
Sears Roebuck and Co. shipped bicycles across the country creating and revolutionizing the mail-order industry and installment buying, selling as many as 100,000 bicycles a year during the late 1890s through its catalog. The top-of-the-line World Supreme New Master Bicycle, Coaster Model sold for $26.95. The 1914 catalog promoted the Kenwood Bicycle, "A Big Value in a Low Priced Bicycle," for $11.95.